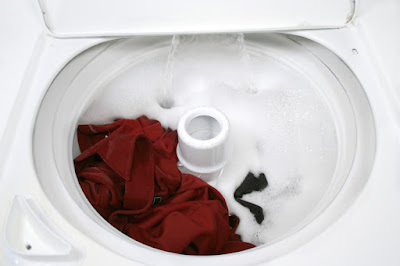 LaundryGoddess.com: Laundromat Tips - Get It Done Quick! SCOPE OUT THE PLACE – Is it clean and maintained? You want to make sure the machines aren’t nasty and that there are clean tables to fold on. Is it in a safe location? Ask the attendant (if any) or if you see someone who appears to be a “regular” there, what the slow days/times are and try to do your laundry then. Peak days are always weekends and usually Mondays. Before leaving for the Laundromat, separate your colors, pre-treat stains, empty pockets, zip up zippers, unbutton buttons and whatever else you usually do at the washer, so that you don’t have to take up time doing it there. Having a few laundry bags will make this part easier if you have a bunch of laundry. If you don’t have laundry bags, improvise – pillowcases work too. You may want to pack some extra garbage bags in case of rain. BRING MONEY – You don’t want to rely on a change machine working all of the time. Some Laundromats use cards, some use quarters, and go prepared. BRING SNACKS – Laundromats are expensive enough; you don’t want to spend more money on the snack machine! You will probably be there for a few hours so bringing your own munchies could save you 5 bucks. Sniff. Yes. Sniff. Does the machine smell like mold or mildew? That will transfer to your clothes. Go to another machine. Do you smell bleach? Leftover bleach will ruin your dark clothes. Remove any items that might have been missed by the last person – just like home, little things like socks are often missed. What you really want to look for is anything that could damage your load like ink pens, lipstick, oils, gas (no kidding). If you do encounter anything like that and there is an attendant or office there, of course you should tell someone. DON’T OVERLOAD MACHINES – Stuffing too much laundry in the washer just to save a few bucks will not get your clothes clean. There has to be enough room for the items to agitate and rinse. Same goes for the dryer – everything will take longer to dry and come out more wrinkled if too much wash is crammed into the dryer. CHECK MACHINE SETTINGS – Before paying/starting the machine make sure the load size and temperatures are correct. Gross, yes, but the dryer won’t have to work as hard and it will save you time and money. Don’t over dry your clothes – this may seem obvious, but many people underestimate the power of commercial dryers. DON’T LEAVE – One of the most annoying things to deal with at a Laundromat is having to wait for an available machine, because some inconsiderate person left for who knows how long. Don’t be that person. There are plenty of things you can do for while you are there – read, listen to music, some even have wifi. GET TO KNOW THE MACHINES – Every Laundromat has a dryer that seems to either run longer or shorter than it should. Some washers may not spin/drain as well as others. Make note and use this to your advantage (wink, wink). This is a reason to hang around and observe. Now obviously, if you are just making a random trip every now and then, this tip won’t be of much use. Finally, fold your clothes before you leave to avoid excess wrinkling, and don’t bring hangers – that’s just one more thing to mess with - hang at home.